Molybdenum is an essential trace element that contributes to the functions of your nervous system and kidneys. Molybdenum also plays a role in energy production on a cellular level. Although the specific functions of molybdenum are not well understood, the American Cancer Society notes that this element may have the potential to counteract the damaging effects of certain cancer drugs on the heart and lungs. Because the amount of molybdenum that your body requires for healthy function is very small, and the mineral occurs in many foods, deficiency is rare in humans. A recommended dietary allowance, or RDA, for molybdenum was established in 2001 and is 45 micrograms for men and women ages 19 and older. The quantity of molybdenum in the foods you eat may vary according to the amount of molybdenum in the soil in which these foods are grown. 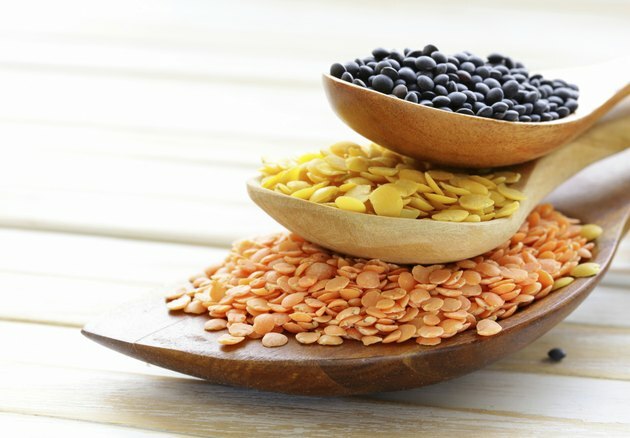 Beans, peas, lentils, nuts, leafy vegetables and liver provide molybdenum. People who have a genetic condition that interferes with their absorption of molybdenum, or who receive nutrition intravenously due to a prolonged illness, may be at risk for molybdenum deficiency. Most healthy people get more than the RDA of molybdenum from dietary sources. According to the Linus Pauling Institute, the average American man gets 109 mcg of this element from dietary sources each day, and the average American woman gets 76 mcg daily. Very few cases of molybdenum deficiency in humans have been documented. According to the Merck Manuals Online Medical Library, in 1967, a child with a genetic disorder that inhibited the utilization of molybdenum showed neurological symptoms and developmental delays as a result of the deficiency. Another documented deficiency, published in a November 1981 report in the "American Journal of Clinical Nutrition," concerned a man who received intravenous nutrition for 18 months and developed an intolerance to certain amino acids – structural components of protein -- as a result of inadequate molybdenum. Based on limited case studies, a molybdenum deficiency may cause metabolic disturbances that lead to developmental delays, seizures, visual alterations and neurological changes. The patient in the 1981 "American Journal of Clinical Nutrition" case report suffered from headaches, night blindness, and an accelerated heart and respiratory rate. The patient eventually became comatose, but recovered from his symptoms after his nutritional solution was supplemented with a form of molybdenum. More clinical research is required to determine the effects of molybdenum deficiency in the human diet.